The Cerro del Cubilete (in English, "Dice Cup Hill") is a 2,700 metres (8,900 ft) mountain in Silao Municipality in Guanajuato, Mexico. Cerro del Cubilete is one of the most historically important religious shrines in Mexico and marks the country's geographical center. The current structure and base for the 23 metres (75 ft) statue was created by artist Nicholas Mariscal in 1944 to honour the struggle of the Cristeros. In the words of former Mexican President Vicente Fox, the statue serves as a "rebuke to the suppressors of religious freedom" who sought to quash the Church during the persecution of Christians in Mexico during the first half of the twentieth century. 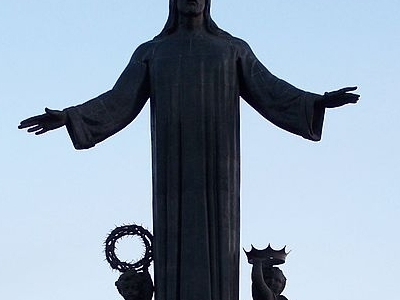 The site was originally occupied by a smaller statue of Jesus, "Christ the King". It was destroyed by bombers directed by the anti-religious (and particularly anti-Catholic) regime of President Plutarco Elías Calles, as part of his mission to kill Christian rebels and destroy all Christian symbols during the nation's critical "Cristero War" when state atheism was enforced. Both the building at Cerro del Cubilete and the statue of Christ follow the style known as art deco. Inside, an Altar sits on a circular platform of three steps. A symbolic royal crown hangs above the altar, suspended in a large polished metal dome. Natural light filters through carved slots in the fine marble walls, creating a mystical glow. 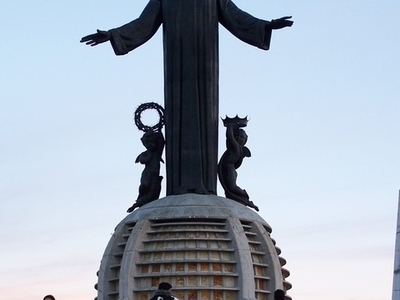 The outside of the large, ribbed dome serves as the base of the newer statue, also named "Christ the King". Its arms are open, with angels kneeling at either side - one holding the crown of thorns, the other a royal crown. Here's the our members favorite photos of "Sculptures in Guanajuato City". Upload your photo of Cristo Rey Mexican Statue!